It’s inevitable that during the holidays we all are going to get a little stressed, including our beloved pets. Holiday travels, family and guests, dinner parties and shopping can lead to unpredictable schedules and provoke anxiety for our pets. Keeping these tips in mind while you are preparing for Thanksgiving and Christmas will ensure your pet is calm and comfortable for the holidays. Make sure wherever you are, your pet feels safe. Doing a little prep work can certainly alleviate an anxious pet. If traveling with your pet, whether cross-town or on an extended trip, make sure you pet feels safe. Bring along his favorite chew toy, blanket and some treats. While his routine may be off, at least he has some familiarity with his everyday toys. Toss in a new toy or treat to reward good behavior and reinforce his good behavior while away from home to avoid any embarrassing moments around family and friends. Practice basic obedience training a week or two prior to traveling to a new environment. You can also try a toy with a treat compartment which is a great way to challenge your dog’s mind and keep him occupied longer. We offer several options in the store with treat pockets like our West Paw toys and Beco line which is a great brain stimulator. Likewise, a perfect addition to your pet collection is a Molly Mutt dog bed. Simply fill the doggy stuff-bag with your old clothes, towels, blankets, pillows, or anything else with your sent and pick a machine-washable duvet cover to go over the top. There are lots of designs to match your dog's personality! Items like these are sure to bring comfort to your pet because they have your scent all over it! Your pet will likely get overly excited with a large number of people in the room or even in new environments. It’s important that in these situations they also have their own space to feel comfortable and to escape all the commotion from the gathering. Designate a private room either in your own home or at a guest’s house where you can leave your dog to relax and rest. Don’t forget the first tip; provide your dog with a few toys and/or treats to occupy his mind and give him something challenging to do or play so he’s entertained. It may be hard to find the time, but if you’re able, go for an afternoon stroll with your dog so he can release all his energy. Mature pets and puppies especially need their daily exercise. There is definitely an interconnectedness and bond when you’re able to enjoy a walk with your pet. By sticking to this routine, you’ll have positive results with your pet during the holidays and on a regular basis. Besides the obvious physical benefits of walking your pets, it’s also known to decrease hypertension and depression. If you’re noticing behavioral changes in your pet such as chewing, restlessness, or whining, it could be a result of needing more attention and an indication that your pet needs a stress-relieving walk. Remember, a tired dog is a good dog. 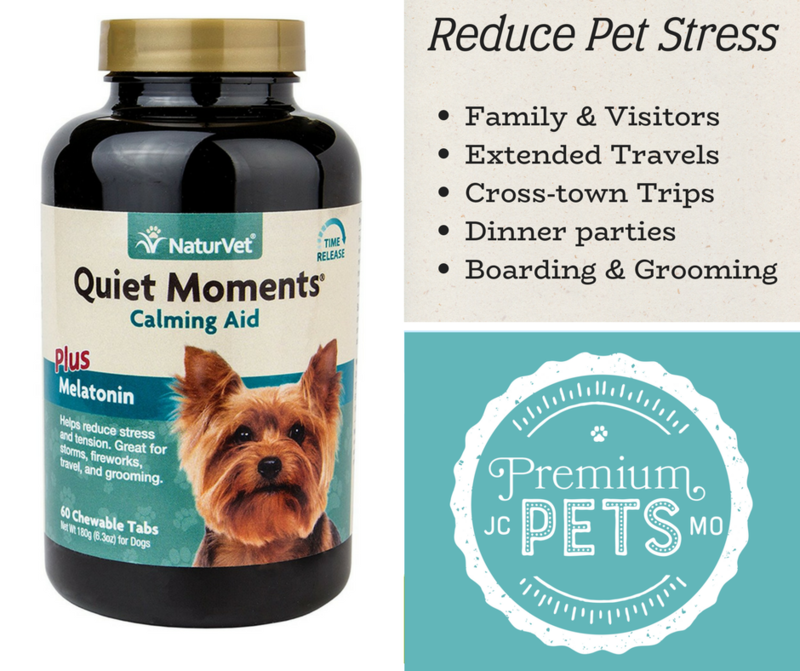 There are a number of natural supplements on the market that can ease your pet’s stress and will make the holidays more enjoyable for everyone. Natural supplements are best used for traveling, crate training or keeping in a crate, new environments, grooming, visits to the vet, fireworks, or thunderstorms to name a few. These supplements come in chewable tabs or calming room spray and do reduce stress and tension. They’re formulated to make your dog feel safe and simulate canine pheromones. This alleviates those stressful situations for both the pet and the pet parents and starts working as soon as 5 minutes.